If you are missing a tooth, you may experience difficulty chewing and speaking clearly. You may also feel self-conscious about your incomplete smile. Meanwhile, if you fail you fail to replace the tooth, you face the risk of additional oral health issues including further tooth loss. Fortunately, an implant-supported crown can replace the entire tooth, restoring the function and aesthetics of your smile. Dr. Teddi Olszewski can perform dental implant surgery and place your restoration at her Northampton, MA, practice. An implant-supported crown comprises two parts: a dental crown and a dental implant. The dental implant replaces the portion of the tooth below the gum line, serving as an artificial tooth root. The dental crown closes the gap in your smile by replacing the portion of the tooth above the gum line. Crowns made of dental-grade porcelain or other tooth-colored materials are virtually indistinguishable from natural teeth. 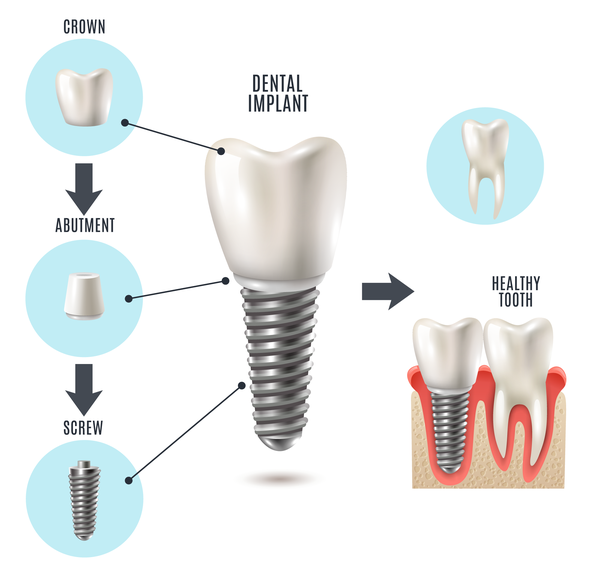 An implant-supported crown replaces the entire tooth, from the root to the chewing surface. For the right candidates, an implant-supported crown is a better solution than a traditional dental bridge. A dental bridge only replaces the portion of the tooth above the gum line. The restoration is then secured by two dental crowns, which are placed over the teeth on either side of the gap. This requires altering the teeth to accommodate crowns, which involves removing a significant amount of healthy dental tissue. Unlike an implant-supported crown, a dental bridge cannot halt the jaw atrophy that takes place in the absence of tooth roots. The many oral health benefits of dental implants make an implant-supported crown an excellent choice for restoring your smile. Is an Implant-Supported Crown Right for Me? During your consultation, Dr. Olszewski can evaluate your oral health to determine whether an implant-supported crown is the best solution for your needs. If you do not qualify for dental implants, she may recommend an implant-supported bridge or denture. For the right candidates, an implant-supported crown is a better solution than a traditional dental bridge. First Dr. Olszewski will surgically place the dental implant post. You will then need to heal for about four to six months as the implant fuses with the jawbone in a process called osseointegration. During this time, you will be provided with a temporary crown. Once healing is complete, she will attach an abutment piece to the implant, which will serve as the point of connection with your crown. Next, she can take an impression of the implant and surrounding teeth, and this will be used to craft your custom restoration. In about two weeks, your crown will be ready for placement. To find out if an implant-supported crown is the best way to complete your smile, contact our Northampton practice online or call us at (413) 584-2902. Dr. Olszewski views her patients as part of her "dental family" and strives to provide treatment that is your best interest. She will help you find the best solution to repair your smile and restore your confidence.